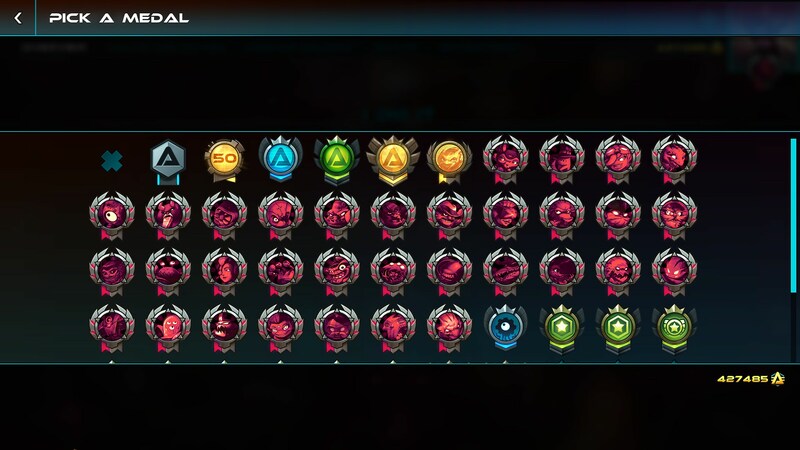 34/34 mythical medals, snork has 250 wins but his medal is currently bugged. Now kewn, if I could just get you to do that one thing I've been asking for 4 years for..
if I could just get you to do that one thing I've been asking for 4 years for..
F2P console version so you could do it all over again? Lol. Anyways nice job man that's some dedication. I know there were probably some characters you absolutely hated playing. if I could just get you to do that one thing I've been asking for [so many] years for.. Probably the newer nauts have those higher though for you, and your stronger nauts might be lower due using them from the beginning when you werent that good yet. How did you manage to do all these medals without breaking yourself inside. ...having said that, i do sincerely hope you got some of them vs bots. I can't imagine how miserable it must be to get all of them through PvP alone. For clarification, qi'tara and snork had a large amount of bot games tied to them so I only used their non-bot game stats. The reason for this is I absolutely despise their designs and gameplay, and find no enjoyment in playing them so I didn't feel like grinding them out. I don't really like gnaw either, so he got a chunk of bot games to his name too. The top 3 win rates: commander rocket (90.91%), voltar (88.34%), ted (86.51%). Rocket wins were gained when he was the #1 character, voltar I can probably tie his reason down to being a very oppressive character in pubs while playing duo/pre (I would never solo as voltar). Surprisingly ted comes in at third when I'm a really trash ted player - I think this is because I just played him super safe with airstrikes and clearing because I'm not confident in brawling with him. It gets wins, but it doesn't mean I'm any good with him. Best K/Ds: commander rocket (2.83), sentry (2.68), ksenia (2.38) (max was very close at 2.32). Again, nothing is going to beat rocket's reign of terror when he was #1 and I liked to think I was damn good at him too. Sentry was my main for a long time before he got all stupid, as well as a lot of ksenia games when I had a phase of her (I still believe she's the most skill intensive character in the whole game). Max is my most recent "main" and thankfully the stats show I'm pretty good at him. Worst K/Ds: yoolip (1.27), deadlift (1.47), genji (1.47). These are ignoring the characters with large amount of bot games (snork has a negative K/D but I'm sure it'd be positive if I could be bothered to learn him - but I can't). Yoolip is just crap, I know I play too aggressively with deadlift and just lunge into everything. Genji is kinda weird since he's hard to kill, I guess it's just the low amount of kills he naturally gets as a low-damage support offsetting him. Qi'tara and snork had large amounts of bot games cause I hate them a lot for a few reasons. Gnaw I'm not fond of playing so he got some too. There's a few more sprinkled here and there but nothing really noteworthy. Ha, great. Thanks for the sheet. 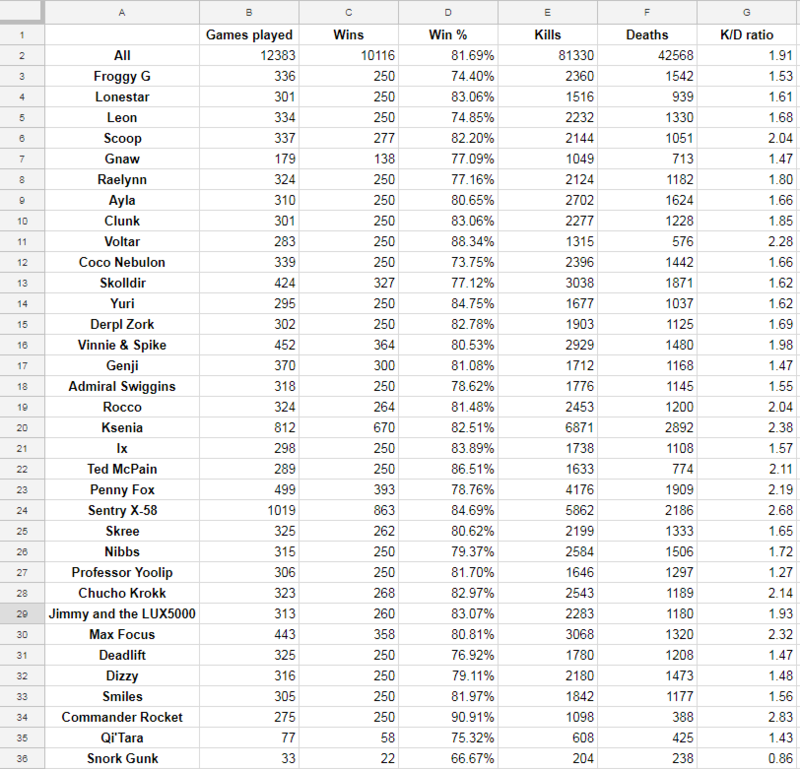 Kind of dishearting to see how your weakest naut win% are better than my strongest mains though, lol. Your Rocco could still top him, if you played that stupid Tip Top mode . At least it broke my Most Kills Ever permanently with 37 kills as Rocco, even though Rocco is my bottom 3 worst nauts as a pad player. Doesn't help that you have terrorized the whole ladder when rocket was nuclear bomb tier.